SlipAlert� is designed to behave in the same way as the heel of a shoe as it slips across the floor, whether it be dry, wet or contaminated with some other liquid. In order to do this SlipAlert has been carefully designed so that the characteristics of the machine, for example its weight, the size of the slider, its speed, etc., all combine together correctly to simulate a heel slipping on a hydrodynamic lubricating film. Unless the correct combination is achieved the lubricating film will either fail to provide any lubrication at all or provide too much. As a result any test machine which does not have the correct combination of characteristics will suggest either that a floor is safe when its accident record clearly shows it is slippery, or that the floor is slippery when users� experience shows that it is not. Above photos and videos are courtesy of Safety Direct America. Until now, only one portable slip test machine has been recognised by bodies such as BSI, HSE and the UK Slip Resistance Group as correlating with slip accidents. This is the TRL Pendulum as described in BS 7976. It is an excellent and reliable machine, but it is relatively expensive. It is portable but very heavy and bulky. It takes some time to set up and take a set of readings, and it requires an experienced operator to ensure that the test result is reliable. SlipAlert� has been developed to complement the Pendulum so that virtually anybody can carry out a test and discover how the floor surface would fare if tested by an experienced operator using a Pendulum. SlipAlert� is not intended to be relied upon as the sole means of testing in legal cases or for manufacturers� specifications - those should still be tested using a Pendulum. SlipAlert� can still be of great value following a slipping accident as a test can be made immediately after the accident by untrained personnel whereas it may be weeks, months or even years after the accident that the various parties agree to the not insignificant cost of getting a specialist organisation to come and test the floor with a Pendulum. Operation of SlipAlert� is simplicity itself. 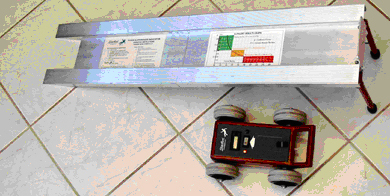 Its ramp is set on the floor to be tested, SlipAlert� is switched on and pulled backwards to the top of the ramp, whereupon the indicator lamp switches from red to green. 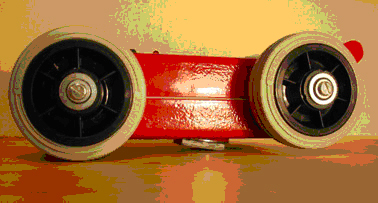 The operator simply lets go of the handle and allows SlipAlert� to roll down the ramp and across the floor. When it stops, the reading on the counter is noted and this is then converted to a reading of coefficient of friction or equivalent Pendulum Test Value using a graph on the ramp or the set of tables provided. Alternatively the reading can be categorised as �safe�, �marginal� or �dangerous� from the limits shown on the graph. To those not used to dealing with Coefficient of Friction, Pendulum Test Values etc., the graph shows operators whether the reading corresponds to a Safe, Marginal or Dangerous floor. It is anticipated that this machine will be particularly useful to those individuals who are directly or indirectly responsible for the safety of employees, customers, visitors and tradesmen who visit their premises. The cost of personal injury claims is forever increasing. SlipAlert if used in a sensible and conscientious manner, could contribute significantly to reducing personal injury claims and also other costs associated with slip accidents. Global Safe Technologies Australia and its Authorised Dealers are all using the Slip Alert� device and its measurements are used in providing - both our initial complimentary as well as part of our industry unique FSMP� -Floor Safety Inspection Reports. Do Any Machines Give The Right Answer? The right answer is one which correlates with the risk of slipping accidents. Studies over many years and experience in UK has shown that the TRL Pendulum, as described in British Standard BS 7976, does react correctly. A new machine, SlipAlert, was specifically designed to take into account the role of the hydrodynamic lubricating film and uses a slider which simulates shoe sole material. As a result SlipAlert correlates with the Pendulum. In Australia, the SlipAlert� exclusively distributed by Peter Vournechis of Australasian Slip testing. Global Safe Technologies Inc (Canada) is the exclusive distributor of the Slip Alert� in Canada and all members of the Global Floor Safety Network are using the Slip Alert� for measuring floor slip resistive qualities.